1. Hosts' rules: Although you are paying for your room and board, remember that the household in which you are staying is neither a hotel nor a dormitory. Your host will treat you as a new family member, a guest, and a renter. Each homestay is unique; therefore, you will need to discuss the rules of the house when you move in. What time is dinner? How may I help with dinner preparations/clean up? Which meals will I need to prepare for myself? What time do most family members go to bed? And when must I be very quiet? Can anyone help me with my homework? When can I get help? How loud may I play my radio, stereo or television? May I bring my friends home with me after school or on the weekends? What is the time limit for showers? You will think of many more questions; we encourage you to discuss them with your host. 2. Settling in: Your host can help you with many details: setting up a bank account, getting a Washington State ID, and getting a private phone line installed. Of course your host will give you a house key and teach you how to take the bus to and from school. 3. Speak as much as possible and ask questions: Do not be embarrassed about your level of English speaking ability. You are here to learn! Communicate your needs, ask for advice, talk! You can't improve your speaking and listening skills if you stay in your room. Be sure to talk with all the members of your household. 4. Host' activities: You will be invited to participate in family activities and outings. This is one of the main reasons why you are a part of the home stay program, so try to join them whenever possible. If you cannot participate, tell your host family at least one or two days in advance and thank them for including you. It's polite to ask them in advance if it will cost extra. You can ask "how much shall I pay?" and "how much spending money will I need to bring?" 6. Helping in the homestay: In most households, all members are expected to help with the housework. In most homestays, the mother does not stay home full time, so the children learn to make their breakfast and lunch at a young age and husbands cook, clean and do laundry. Always make your own bed and keep your room clean weekly by removing garbage, vacuuming and washing your sheets. Ask where to put your garbage and recycling. Offer to help set and clear the table for shared meals, and/or put dishes in the dishwasher. Make sure that you know how the kitchen works: what goes down the sink drain and /or garbage disposal, what gets thrown out and what gets recycled. Learn where the utensils, cups and dishes are kept, and always clean up after yourself. Ask how to operate the washer and dryer and what times and days you can use the machines. Keep the bathroom that you use clean and tidy; learn how the shower and bath work; and what not to put down the toilet, as well as how to keep the shower curtain inside the shower (American homes do not have drains in the bathroom floor!). Wipe the sink and counter area after you are finished. Volunteer for another chore you can do as your share of the housework. 7. Thank you: Please remember to say "Thank you" when your host helps you and after you have enjoyed a delicious meal. 8. Keep your host informed of your schedule: Your family needs to know if you will be coming home late, or if your plans change, or if, for any reason, you will not be home as expected. Please call home and tell them or leave a message, so that they don't worry about you. This does not mean you cannot be independent. You are being a responsible adult when you tell your host about your plans. 9. Role of host father, mother and children: The roles of women and men in the US may be different from that in your own country. Don't be surprised if your host father cooks dinner or washes the dishes. Children may seem very outspoken. Age is not as important in the US in the way we speak to each other. 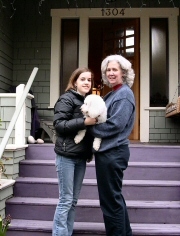 Of course we hope you feel comfortable in your homestay, but it will take time for you to get used to our family life. We hope you speak to all your hosts with the same respect; however if the children are bothering you, it is very acceptable to tell them (politely) that you don't want to be disturbed. If it continues, please talk to one of their parents. 10. Strong odors: Please be aware of the fact that strong odors (body odor, cologne or perfume, garlic and smoke) can be very irritating to Americans. Like in many countries around the world, Americans bathe every day, use deodorant after bathing, and wear clean clothes each day. They also brush their teeth at least twice a day after eating. Some people are even allergic to cologne, perfume or smoke. 11. Driving: If you plan on driving, be sure that you have a valid state driver's license or an international driver's license. You must also have automobile insurance. Ask your hosts for help finding the licensing office and calling an insurance company. Do not ask to drive the host's car. 12. Smoking: None of our hosts allows smoking inside their homes. If you smoke inside the homestay, you may be asked to move immediately. When you smoke outside, please do not leave cigarette butts for your host to clean up. 13. Drinking: You must be over the age of 21 to purchase or drink alcoholic beverages. In all cases, never bring any alcohol into your home without the permission of your hosts. As it is with smoking, Americans have become quite sensitive to the dangers of alcohol and excessive drinking will not be tolerated. Never drink alcohol before or while you are driving or in your room. 14. Drugs: Any form of recreational drugs is illegal. If you are arrested by the police for using drugs, you will go to jail. 15. Medical: Whether you have insurance from your home country or from your school, you need to carry the insurance information with you at all times. Please show your host your card that shows your coverage. If you get sick, your host should help you go to the doctor. If you have a serious accident or illness, an ABODE staff will also help by calling your parents, the school or other authorities as appropriate. If you take medications, please share that information with your host. They need to know in case you have an emergency. If you are staying more than one month, the labels on the medications should be in English. 16. Trial period: Your first month in your homestay is a time for your host and you to try living together. If it is not a good match (too noisy, too quiet, too dirty, too clean, or your personalities just don't get along), please contact ABODE immediately. We can arrange for you to visit and/or move to a different, more suitable homestay as soon as possible. Since you have signed an agreement promising to try homestay for one academic term, you should not move to an apartment during your first three months. 17. Two weeks' notice: By signing the Homestay Agreement, you promise to try homestay for one academic term (usually 3 months). After that, if you would like to move to an apartment, you must give your host family at least two weeks' notice. This means that your have paid the host for two weeks' from the date you inform them you are moving. Even if you choose to move out before the end of two weeks, the hosts must be paid for the full two weeks. Don't wait to tell them your plans on moving; hosts need to know in advance what is happening in their home. Return house key(s) to your host. Give your host a forwarding address and phone number, in case mail or important calls come after you move. Go to the post office and fill out a change of address form; inform your school registrar and your bank of your new address. Clean your room thoroughly, remove all garbage and personal items. 19. Contact ABODE: After you discuss these points with your host family, if there is something that you still do not understand or if you have some questions, we encourage you to discuss this with your host family. They really do want to help you, but they will assume you understand if you don't speak up. If you are having problems with your host family or there is something you do not feel comfortable discussing with your host family, please call ABODE at 206-527-8654, or email us at info@abodehomestay.com. We will make arrangements to meet with you and help to resolve the problem carefully. We promise that your call will be confidential (we will NOT discuss your problem with the host without your permission). Good luck with your studies and enjoy your stay in the United States!